Google has brought Allo to the desktop. This is the first time Google’s chat app (one of many Google chat apps Google Splits Hangouts Into 'Chat' and 'Meet' Google Splits Hangouts Into 'Chat' and 'Meet' Google is splitting Hangouts into two separate apps, Hangouts Chat and Hangouts Meet. No one seems to know why, but it's happening nonetheless. Read More ) has been available on the web. Unfortunately, you’ll need to be using Allo on an Android handset and have Chrome installed on your computer in order to use Allo on the web. At Google I/O 2016, Google unveiled Duo and Allo. The former is focused on video calling, while the latter is for messaging. Allo hasn’t exactly set the world alight compared to the likes of Messenger and WhatsApp, but Google is persisting with it. And now, it’s available on the web. 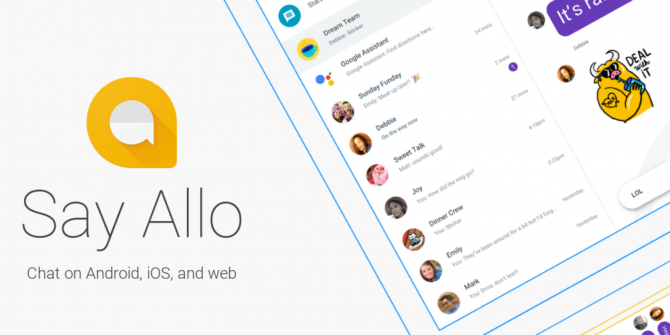 Google has opened Allo up to desktop users. The company teased the fact Allo was coming to the web earlier this year, but it’s taken until now for the company to roll it out. Even now it’s getting something of a soft launch, as it’s disappointedly only available on Android and Chrome. Despite its limitations, most of Allo’s best features have made the move to desktop. That means smart replies, stickers, and emoji are all available on the web version. Even better, Allo brings Google Assistant with it to the desktop, which may just make the whole thing worthwhile. Go to allo.google.com/web on your computer. Open the Allo app on your Android handset. Open the menu and click “Allo for web”. Scan the QR code displayed on your computer. Google promises that iOS support is coming soon, but for now Allo on the web remains an Android exclusive. Thankfully, iOS users have plenty of alternatives. How Many Chat Apps Does Google Need? There’s nothing wrong with Allo. It certainly does the job it’s intended to do. The problem is figuring out its place in the Google ecosystem. Google also offers Hangouts (Chat and Meet), Voice, Duo, and even YouTube now boasts in-app messaging YouTube Adds In-App Messaging on Android and iOS YouTube Adds In-App Messaging on Android and iOS YouTube is making a concerted effort to keep you using its app for longer. In order to achieve this lofty ambition the Google-owned company is adding messaging to its mobile app. Read More . So what exactly is the point of Allo, whether it’s residing on your smartphone or desktop web browser? Answers on a postcard, please. Do you regularly use Allo on your smartphone? If so, what made you choose Allo over the competition? If not, which messaging app(s) do you use instead? Can you see yourself using Allo on the web? Or do you not the point? Please let us know in the comments below! Explore more about: Google, Instant Messaging.